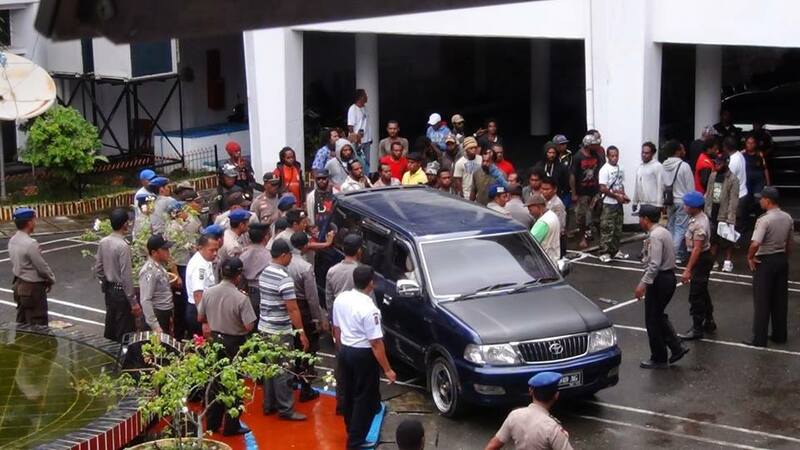 On 13th January 2014, Indonesian police arrested 47 West Papuan activists who were gathered at the office of the Papuan Legislative Council (DPRP) in Jayapura to welcome and support representatives of the Melanesian Spearhead Group (MSG). The MSG visitors included the Foreign Ministers of Papua New Guinea, Solomon Islands, Fiji and Kanaky who were on a fact finding mission ahead of the decision on allowing West Papuan membership to the MSG. Approximately 35 Indonesian police officers, arrested and forced into police vehicles 47 West Papuan protesters including the elderly. 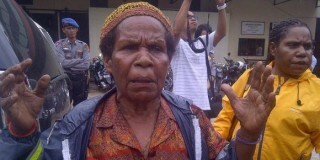 In a video, an elderly Papuan woman can be seen being physically harassed and pulled by the police. This is Mama Yosepha who is an environmental activist who won The Goldman Environmental Prize in 2001. She was also among those arrested after her clothes were torn by the police as she was trying to stop them taking away others. Hundreds of activists originally gathered outside Sentani airport at 06:00 where the delegates were flying into but hundreds of Indonesian police and soldiers were already ready and waiting for them so they then proceeded to the DPRP Office at around 10:00. We have information that all of the activists have been released but will continue to keep you updated as events proceed. In addition, hundreds of West Papuan students gathered outside the Cendrawasih University (UNCEN) in Jayapura and demanded that West Papua join the Melanesian Spearhead Group. In this video, hundreds of Papuan students can be seen demonstrating in front of UNCEN and by coincidence, hundreds of Western English speaking tourists were outside taking photos. As English speaking protesters tried to explain the situation to the tourists, Indonesian police and plainclothes police (who are everywhere in West Papua) tried to move the tourists back into their tour buses before they could discover the truth of what is really happening inside West Papua. 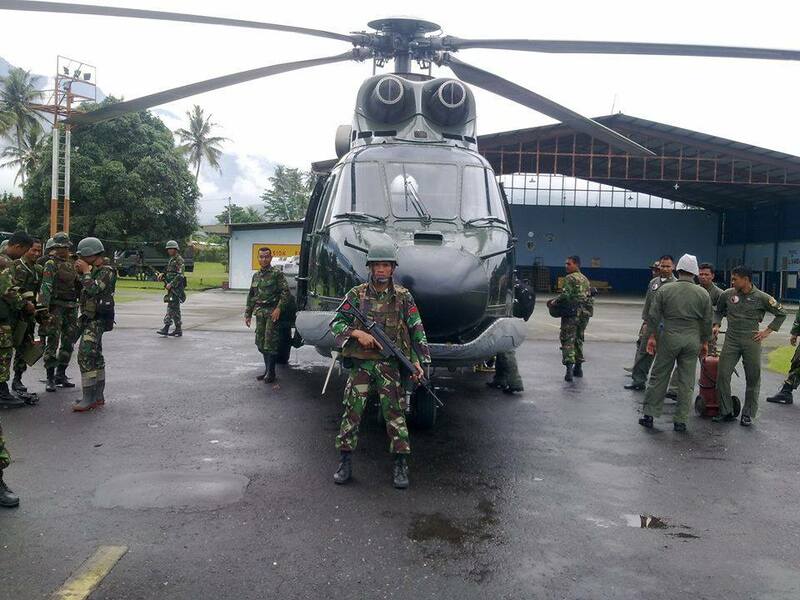 The Indonesian officials were so worried about the MSG officials seeing West Papuan protesters, they “secured” the area of the delegates with Indonesian military attack helicopters and dozens of fully armed Indonesian soldiers. Indonesia coordinated and restricted the movements of the delegates so greatly that they did not even meet with any Papuan civil representatives. 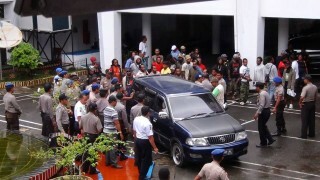 All of the meetings the delegation attended were held in secret with almost entirely Indonesian government officials and not one of the delegates were even seen by a single West Papuan activist and 47 people who just protested peacefully were arrested and held until the delegation was already on its way back to Jakarta. After Indonesian security, police and plain clothes police dispersed the demo and the car moved on, the Indonesian President ordered that the doors to the hotel where the meeting was being held “be boarded up” to prevent the large amounts of West Papuan students protesting in front of the hotel from gaining entrance and to prevent the MSG delegates even looking another Papuan in the eye again. Papua New Guinea’s foreign minister, Rimbink Pato, claimed yesterday that he “did not see any human rights violations during the one day he was in West Papua”. This is hardly surprising seeing as he and all the other foreign ministers were escorted by military helicopters and armed soldiers constantly in cars with blacked out windows and only meeting with Indonesian government representatives. During the meeting with the Indonesian President and international war criminal, Susilo Bambang Yudhoyono (SBY), the President and the Indonesian Foreign minister gave their “recommendations” to the Melanesian Spearhead Group that they do not think that West Papua joining MSG would be a good idea. The Indonesian foreign minister said he hoped that “Vanuatu would change government”. Sadly. the Melanesian foreign ministers also signed treaties with the Indonesian government pledging their support and “respect for territorial integrity”. 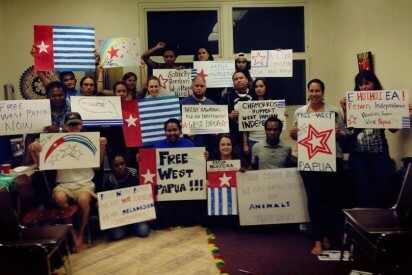 The events of this week show a clear symbol to the world that Indonesia still has much to hide in West Papua, that there is evil being committed by Indonesia behind closed doors within West Papua and that Indonesia is by no means a democracy.